It took awhile for the Broncos offense to get rolling on Sunday, but once it did, they never looked back, putting up 41 points as the Broncos trounced the hapless Raiders 41-17 in Oakland. Peyton Manning was 31 for 44 for 340 yards. He extended his record with at least two touchdown passes in 15 straight games and his streak of 48 games with at least one TD pass is third longest, breaking a tie with Johnny Unitas. 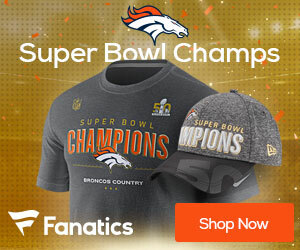 He threw five TD’s in less than 17 minutes, throwing two TD passes to Julius Thomas and two more to Emmanuel Sanders as the Broncos rebounded from last week’s loss at New England. With the win, the Broncos move to 7-2 on the season, and looked solid in their bounce back game from the bad loss to the Patriots. RB CJ Anderson finished with 90 yards rushing and 73 receiving. Demaryius Thomas had 11 catches for 108 yards. The slow start saw the Raiders get a pick off Manning and jump out to a 3-0 lead, their first lead over Denver since 2011. 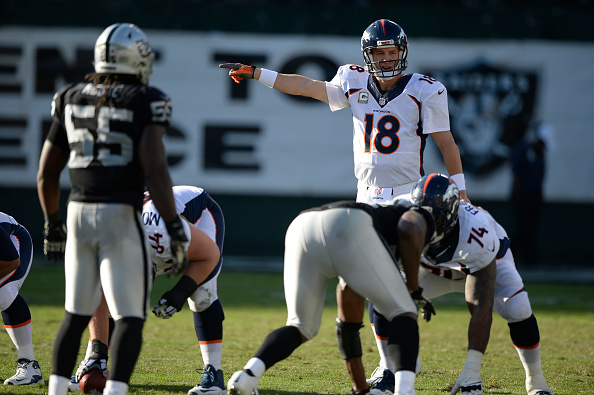 The Broncos then got field goals on a pair of drives inside the Oakland 20 as Manning struggled to get into rhythm. The problems for Manning got worse when defensive end Justin Tuck made an athletic interception, jumping to tip a pass and then catching it himself to give Oakland the ball at the 12. It didn’t last, as Manning and the offense got going, and by half led the game 20-10. Raiders rookie QB Derek Carr threw for 192 yards on 47 attempts, most of the production coming on a meaningless touchdown drive in the closing minutes. He also had two interceptions. The running game was limited to 30 yards on 15 carries, as the Broncos defense played well in the blowout win. Manning continues to play at a different level from almost every other NFL QB out there.